Ever since the first iPhone, there has been a “Notes” application. However, the ability to save and manage notes has always been fairly minimal. Now, with iOS4, Gmail users can easily manage their notes, even across multiple Gmail accounts. 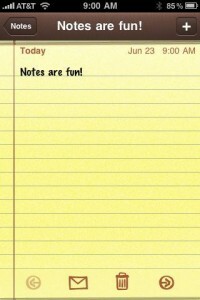 One of the apps that is seemingly unchanged from the very first iPhone release is the Notes app. While it fulfills the basic functions of a notepad, many users want more functionality. Specifically, people want a good way to save and manage their notes. Up until recently, your only options were emailing directly from the Notes app, or syncing with iTunes. 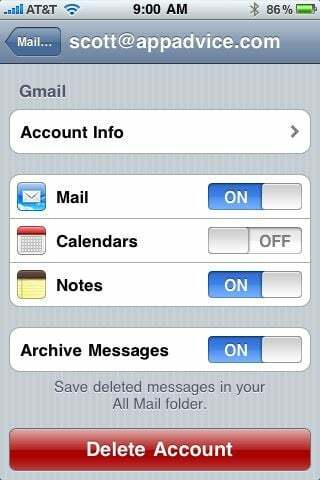 iOS4 users who have Gmail accounts will notice a few new settings. Amongst those is the ability to individually toggle mail, calendar, and notes syncing. If you turn on notes syncing, all of your notes will automatically be copied to your Gmail account. Once they are synced however, they may be difficult to find. To find notes inside Gmail, look for a “Notes” label on the left side of the sceen. If it is not visible, the label may be hidden. Click on the link that says “X Number more” (in the above screen shot it indicates “3 more”) to pull up the list of all labels. Once you click on the “Notes” label, you should see all of your notes copied over from your device. The synchronization is done over-the-air, meaning it does not require an iTunes sync to copy them to Gmail. From here you can organize your notes, add labels and delete them. The one limitation is you cannot add anything to the notes, or edit them in any way. While this may seem like a flaw in the design, it’s because Gmail is treating the notes as an email message. You cannot edit the notes just as you cannot edit past emails. While not a perfect solution, this added functionality is a welcome improvement.